The start of commercial air service out of Paine Field in Everett may be delayed from this fall into next year, depending on an additional review of the impact on noise and ground traffic by the FAA. The airport director now projects flights to begin in January 2019. Commercial air service at Paine Field in Everett may be delayed from its expected start this fall depending on an additional review of noise and ground traffic by the Federal Aviation Administration (FAA). Arif Ghouse, airport director at Paine Field, said Friday he now expects commercial air service to begin in January, missing the high-traffic holidays of Thanksgiving, Christmas and New Year. The FAA is requiring a new review because the flight operations now proposed by Alaska Airlines, Southwest Airlines and United will bring many more passengers than originally approved in a 2012 environmental impact assessment. Such supplemental reviews, which include a period for public comments, typically take six to 18 months, the FAA said Friday. That leaves a wide-open time frame for completing the review somewhere between November 2018 and a year later. The regulatory agency added that it will release the results of its preliminary analysis for public review and a 30-day comment period before making a final environmental determination. Ghouse said that when the county did its own environmental review for the state, “we knew the airlines were looking at additional flights” and that this was factored into the approval to go forward with the project. News of the FAA review was first reported by the Everett Herald. The three airlines that will inaugurate service at Paine Field plan to operate 24 flights a day, or 48 daily takeoffs and landings. That’s 50 percent higher than airport officials cited last year when unveiling plans for the airport’s future passenger terminal. And it’s double the number of flights envisaged in the FAA’s environmental impact assessment completed in 2012. At the time of that study, the interested airlines were Allegiant, which proposed 1 or 2 daily flights using 150-seat MD-80 jets, and Alaska subsidiary Horizon Air, which proposed up to 10 daily flights using 76-seat Q400 turboprop planes. If those planes were full, that would be just over 1,000 passengers a day boarding flights out of Paine Field. Under current plans, Southwest will fly 5 flights daily using its 143- to 175-seat Boeing 737s, and Alaska’s Horizon Air and United will fly 13 and 6 additional flights respectively, both using 76-seat Embraer E175 jets. Depending on demand, Alaska may later begin to fly in its mainline 737 jets, which seat up to 189 passengers. Even without Alaska expanding its service, that means well over 2,000 departing passengers per day. The proposal to begin commercial air service at Paine Field has been welcomed by many residents of the region north of Seattle as a much more convenient alternative to Seattle-Tacoma International Airport. However, the proposed expansion of traffic at the airfield also drew vociferous opposition from people living adjacent to the airport. A lawsuit brought by a community group and by the city of Mukilteo attempting to block the proposal was finally dismissed last year. The FAA review will offer objectors another opportunity to weigh in and to cite the heavier impact from the proposed doubling of air traffic since the 2012 assessment. Currently small private aircraft do most of the flying at Paine Field. Airport officials said small planes averaged 285 operations per day in 2016, counting not only landings and takeoffs but repeated touch-and-go pilot-training maneuvers, each equivalent to a landing and a takeoff. The airfield is also used by Boeing for its widebody jet deliveries and by aircraft maintenance and overhaul company ATS, which maintains and overhauls airline jets, mostly narrowbody 737s and A320s, and sometimes by the military. Operational data supplied by the airport show these large aircraft last year accounted for a daily average of just 12 landings or takeoffs per day out of the airfield. 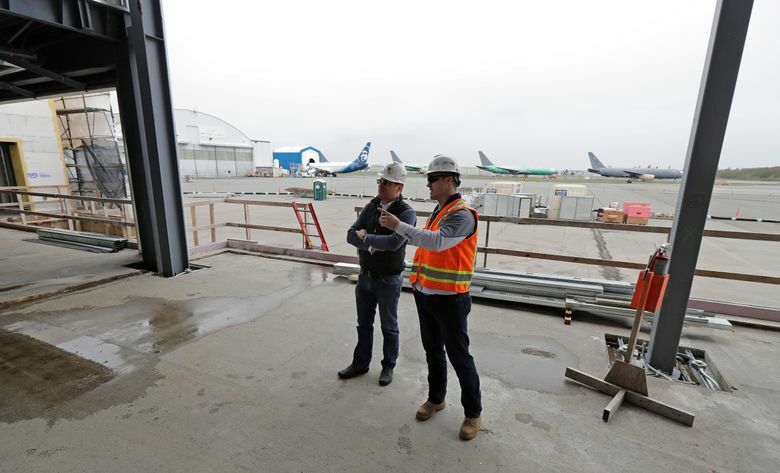 Propeller Airports, which is a subsidiary of New York-based private equity firm Propeller Investments, and Snohomish County are building the new passenger terminal at Paine Field, which is currently under construction. Propeller, which Smith said has so far invested $40 million in the commercial air service project, will lease the terminal for an initial 30 years, paying the county about $430,000 per year plus a share of the revenues: 2.5 percent for the first five years and 5 percent thereafter. Smith said the baggage handling system is due to be installed in the passenger terminal next week and the building should be finished by September 1.